In light of Caillee expecting puppies and the depends which that may entail, it was decided that Josie needed a hair cut, a major one. We cut all her hair off except for her ears and tail. Yes, it's winter but it is not like we live in Winterpeg anymore and Josie has more sweaters and jackets than most people. Josie now has to wear at least a sweater when going outside, she doesn't mind. 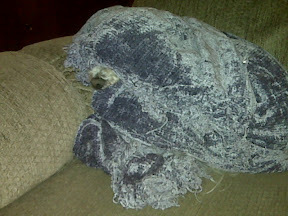 Here is Josie on the sofa using my shawl to hide from the shame of losing all her hair.